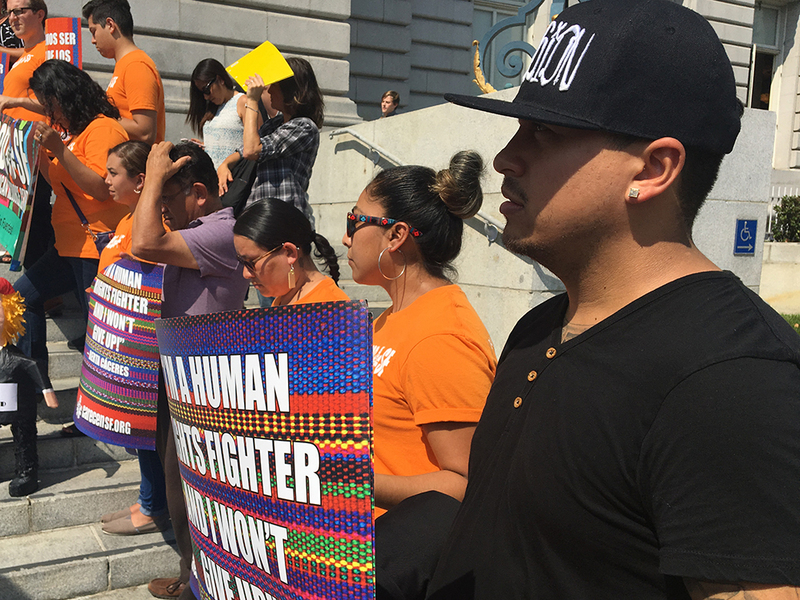 Organizers, advocates and immigrants around the city and in the Mission denounced the elimination of Deferred Action for Childhood Arrivals, a program that allows children who were brought to the United States without proper documentation a chance to get an education or a job. Supervisor Hillary Ronen, who represents the Mission, called the decision “unconscionable, cruel and irrational” at a press conference at City Hall. Attorney General Jeff Sessions gave U.S. Congress six months to do figure out whether and how to protect DACA beneficiaries. But already, the Trump administration has ended DACA recipients’ right to return home and re-enter the United States. It was clear from the response that the end of DACA will quickly become complicated for some recipients, known as DREAMers. Nationwide, about 800,000 people participate in the DACA program. Gerardo Gomez, a DACA recipient who works at Pangea Legal Services, said that today’s announcement will make his life much more difficult, because he was diagnosed with HIV three years ago. If he loses his work, he will be unable to stay in the city or afford his medication. 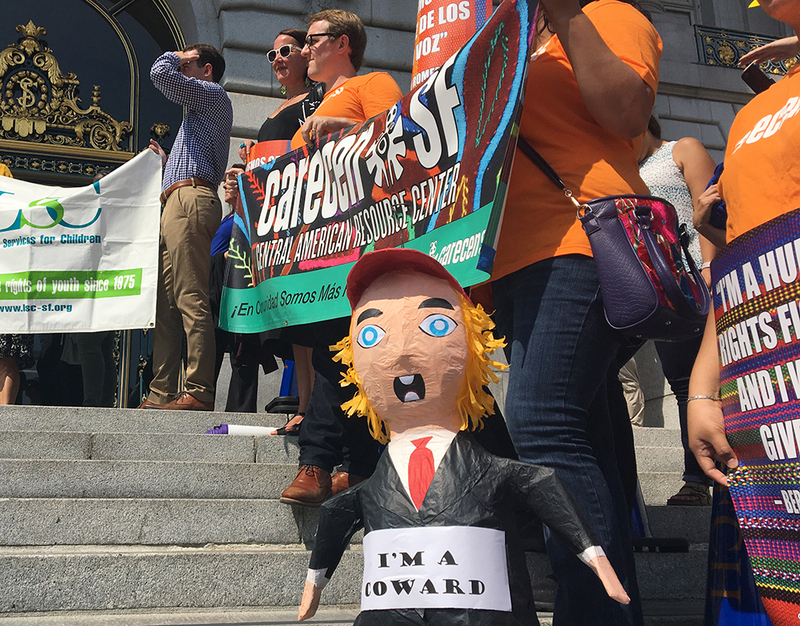 A Donald Trump piñata brought to the press conference at City Hall in response to the ending of DACA. Photo by Laura Wenus. Neighborhood organizations are now working out the best way to support DACA participants. “The United States’ top bully does it again!” the Central American Resource Center, or CARECEN, said in a statement. The organization will hold two workshops a day Monday through Friday, circulate bilingual information about legal rights, and provide legal consultation for every DACA beneficiary who goes to the center at 3101 Mission St.
At Jamestown Community Center for Youth, Executive Director Myrna Melgar said staff and advocates would continue their work educating community members on their rights. “Our whole thing is about making kids feel safe and supported and like they have a chance in life against all of the cultural messages of our society that often marginalize youth of color into that worry of, ‘no, you will not be successful,’” Melgar said. Many Mission organizations not only support young people whose future hinges on DACA, but employ beneficiaries of the program. At Mission Graduates, a neighborhood organization dedicated to guiding youth toward and through higher education, students and staff said they were afraid of what would happen over the next couple of months. “I know our staff have already been dealing with students that have just been dealing with an incredible amount of fear, anxiety and sadness, students who started sobbing when they found out,” said Executive Director Eddie Kaufman. Nonetheless, nonprofits and advocates are determined to continue protecting immigrants. “This is a terrible thing that has happened and we must do what we can to fight against it,” Kaufman said. For now, applications for DACA are no longer being accepted, but those filed before Sept. 5 will still be considered. Advance parole requests and requests to leave and return to the country will no longer be approved. Renewal requests for those working under DACA papers will be accepted up until Oct. 5, 2017 — but only for beneficiaries whose papers expire between today and March 5, 2018. Other elected officials have been more supportive on social media, but organizers want to see action from Congress. Gomez, the DACA recipient, and several others also criticized DACA’s shortcomings, including the requirement for children to accept responsibility for a decision they had no control over. “My parents brought me here at three years old, fleeing a country of violence, criminality and poverty, through a decision I had no input in but now have to face the consequences of,” he said at the City Hall press conference. Several speakers said part of the problem with programs like DACA is that they create the illusion of “deserving” and “undeserving,” or even just “good” and “bad” immigrants. “While our country is a nation of immigrants, it is also a nation that has turned on and scapegoated immigrants almost from day one of the American experiment,” Ronen said. One DACA recipient, who requested anonymity, said she had waited years before applying to the program because it requires what is essentially an admission of guilt from the applicant, who must acknowledge they illegally entered the country. But since the program specifically targets those who arrived as children, it can be a painful contradiction. “How am I going to ask for forgiveness for something I didn’t do?” she said. That admission also raises fear of future repercussions, a fear right-wing commentators stoked after the election. But ultimately, after five years of learning to make a living without DACA, she needed a job that required documentation. Kaufman of Mission Graduates pointed out that when the program’s beneficiaries begin to lose their ability to keep those legitimate jobs, their only option will be to fall prey to the exploitation of employers who take advantage of undocumented workers for low wages. “It’s going to cause many of our DREAMers to have to go back into the shroud of secrecy, and find odd jobs and do what they can to survive,” he said. Advocates will rally at 5 p.m. tonight in front of the city’s Federal Building in protest of the decision.